← Goodreads giveaway! Enter to win one of 10 signed copies of The Daedalus Incident! I’ve been away for a bit, busy with day-job work, some very good flashes of creative writing and, well…vacation. We were originally heading for the Bahamas, but winter weather here and stormy, rainy, cool weather there made us rethink the trip at the last minute. So we went to Vermont, which is always lovely. (For a post on the last time I visited, click here.) We did some skiing, caught up with family and friends, ate and drank exceptionally well, and wistfully plotted our retirement to the Green Mountains at some point. For a nifty take on our adventure, head over to Kate’s blog for some great pictures and thoughts. Aw, yeah. 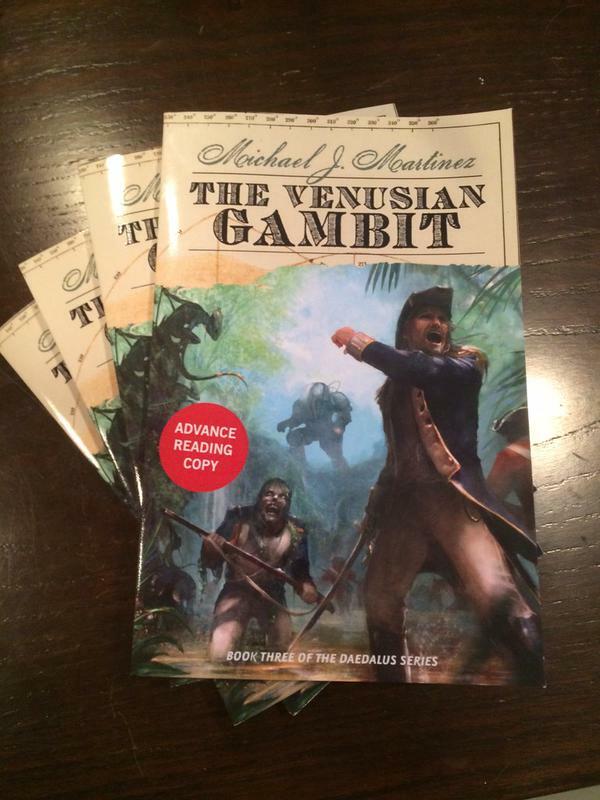 The Venusian Gambit is looking pretty sweet. In addition to these ARCs, I just signed off on the front-and-back cover copy — including a new blurb from an outstanding author that I can’t wait to tell you about, along with a really nice review, too. At some point soon, I’ll likely do an exclusive blog-and-Twitter giveaway for one of these bad boys. I’m also saving one or two for charity as well — the Con or Bust auctions are coming in April, after all. So stay tuned for opportunities to win and/or donate to get an early copy. And I’ll note that the Goodreads giveaway of The Daedalus Incident goes until March 10, and there are 10 copies up for grabs there — signed, no less! Sign up to grab one. On another note, it looks like there may be a chance to save Borderlands Books in San Francisco! This is great news — it’s such an awesome store, and San Francisco will be poorer for its absence. They’ve decided to see if they can sell paid sponsorships to people to keep the store going, and it seems to have worked really well. They needed to sell 300 sponsorships, at $100 each, to keep their doors open. As of yesterday, they sold 230. I’m just getting up to speed on this now, but the sponsorship seems like a great idea. So if you’re in the area, or really just want to support a great institution, get a sponsorship! Click here for how to do it. We're still accepting sponsorships, but we have hit goal of 300! THANK YOU!We would be speechless if we weren't so busy talking to everyone! You should still get a sponsorship, though. Every bit helps! That’s about it for now. I’ll be traveling again in the coming week — this time to Los Angeles for day job stuff — so I probably won’t be blogging a heap. But when the May 5 release date for Gambit gets closer, you’ll be inundated with stuff, no doubt. We have a lot of great, cool things planned to celebrate. And as for Vermont, well…I’ll be back for the Vermont SF Writer’s Series in June up in Burlington. If you’re around, hope to see you there!